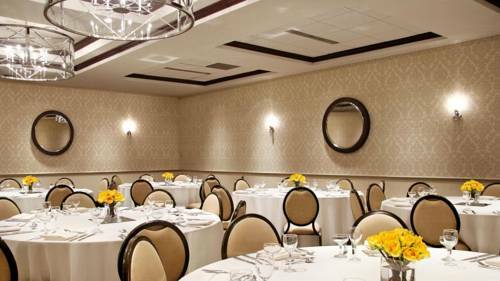 Sheraton Madison Hotel is a modern, dynamic business and social hub in Wisconsin's capital city. Our hotel overlooks Lake Monona, offering a relaxing setting across the street from the Alliant Energy Center and minutes from downtown and the University of Wisconsin. Savor American cuisine for breakfast, lunch and dinner at Heartland Grill. Our fitness center and heated indoor pool ensure that your workout routine won't skip a beat, or you can step right outside the hotel, grab a bike at the B-Cycle rental station and pedal into downtown Madison. For a memorable event of up to 600 guests, we bring groups together in inspiring spaces designed to liven up any gathering. Your room welcomes you with a smart, simple d cor and carefully considered amenities like complimentary Wi-Fi, 24-hour room service and the Sheraton Signature Sleep Experience. Elevate your stay by upgrading to a Club Level room featuring Cub Lounge access. No matter what brings you to town, Sheraton Madison Hotel puts you right where you belong. Heartland Grill: Fresh, hot American cuisine with locally sourced ingredients makes this restaurant a favorite in Madison. Heartland Grill serves a breakfast buffet and a la carte selections for lunch and dinner. 24-hour room service is also available.